Crisálida: Community Arts Project | Crisalida brings their storytelling project to the Galilee Center in Mecca, Calif.
Crisalida brings their storytelling project to the Galilee Center in Mecca, Calif.
17 Jan Crisalida brings their storytelling project to the Galilee Center in Mecca, Calif.
On the morning of January 8, 2015 the team at Crisalida set up their second Storycorps inspired project at The Galilee Center in the city of Mecca, Ca. One of the head directors of the facility Claudia Castorena allowed the Crisalida team to set up a listening booth during a food drive at the center. The team showed up at 11:00AM to set up and get acquainted with the setting. Around noon people from the surrounding community began to show up and receive a ticket for the food drive that was about to take place. There were many people present at The Galilee Center who spoke with us and shared some of their stories and experiences. Unlike the team’s similar endeavor at the Synergy Festival, which took place earlier during the concluding months of 2014, most people at The Galilee Center did not consent to having the audio and/or video devices on while they shared their stories. Between the waiting period when people showed up and when the food was actually distributed the Crisalida team did however have the opportunity to talk with residents from the community of Mecca. 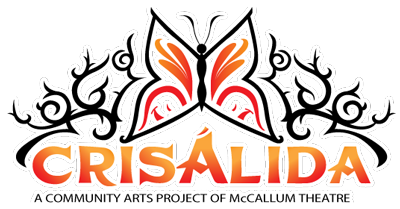 Special thanks to Claudia Castorena, Lupe Torres, and all the kind folks at The Galilee Center who allowed the Crisalida Community Arts Project into their facility.